Jenna Fischer became a mom and an aunt the very same week. “The same week that we were shooting the episode where Pam’s baby is born, I was becoming the aunt for the very first time,” says Fischer, who spoke with PEOPLE about Thursday’s hour-long episode of The Office, in which her character Pam gave birth to a girl, named Cecelia Marie Halpert. And thanks to Fischer, both babies have the same name. In The Office Season 5 episode Stress Relief, Michael holds a roast in his honor, thinking that it will relieve stress in the office. 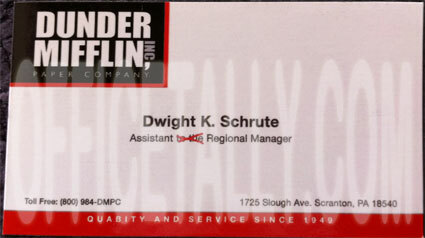 Here is the copy from the ad that Michael Scott produces in The Office Season 4 episode Local Ad. Slough Avenue is a nod to the original UK version of The Office, starring Ricky Gervais, which takes place in the town of Slough, Berkshire, England. There is no actual Slough Avenue in Scranton. In The Office Season 3 episode The Return, Andy creates an a capella version of the song Rockin’ Robin to use as his ringtone. Check out the latest way to waste a buttload of time with NBC’s new Office-enhanced Solitaire game. Thanks to Christine for the tip! Here are quotes from The Office Season 2 blooper reel. Everything you need to know about The Office Jazz Babies Poster, one of the most distinctive decorations of The Office set! 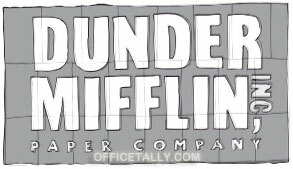 The poster made its first appearance during The Office Season 2 episode, Christmas Party. 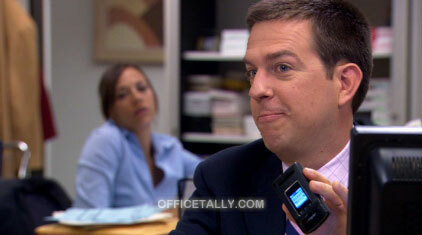 During the office gift exchange, Toby picks Angela as his recipient. Toby: I got Angela. She’s into these posters of babies dressed as adults. I got her one of those. I felt kind of weird buying that. When Michael later turns the gift exchange into Yankee Swap, Kelly receives the poster before it ends back in Angela’s hands. Kelly (unwrapping the poster): Yikes. Kelly: That’s like the creepiest thing that I’ve ever seen. Angela: I’ll take the poster. Some people like these. The poster later become a source of contention between Angela and Oscar in the Season 2 episode, Conflict Resolution. Angela: I got this poster for Christmas, and I feel I want to see it everyday. It makes me feel like the babies are the true artists, and God has a really cute sense of humor.